Despite what people believes, I consider "News of the World" the last album from an outstanding trilogy that started with "A Night at the Opera" and "A Day at the Races", as a fact it's the last one with references to the Marx Brothers, because in 1934 Groucho and Chico Marx made a radio program in which they made mockery about the news of the World. I believe that many people who originally liked the album was overwhelmed by the massive impact that two songs had in the radios and simply rejected all the record, but in my opinion the album is a solid representation of QUEEN'S golden era. 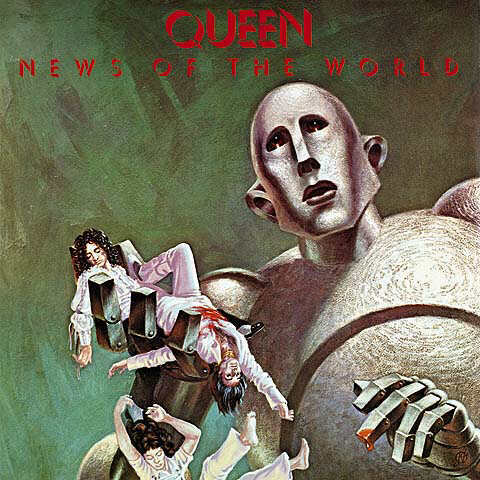 "News of the World" starts with the powerful "We Will Rock You", a strong track that talks about the contradictions of a young man who wants to change the world and how the time turns him into an old man asking for peace, this short song works as an introduction for the universally known "We Are the Champions", a track that has turned into an anthem for all sport contests. "We are the Champions" is at least as good as past songs like "Somebody to Love", in which Freddie Mercury gives us a taste of his incredible voice, sadly the criminal overplay has destroyed the initial impression that was caused on the QUEEN fan. "Sheer Heart Attack" is a frenetic rock that wasn't included in the band's second album with that title, not a Prog oriented or delicate chance for Mercury and May to show their skills, but still a good Hard Rock track. "All Dead, All Dead" is an extremely beautiful tune based mostly on Freddie´s vocals and piano, the usual chorus by Mercury, May and Taylor revive the older spirit of QUEEN'S songs, plus Brian's unique guitar and the duet Taylor & Deacon giving all the support a rhythm section can. More melancholic and simultaneously pompous "Spread Your Wings" is another track in which all the band does the best possible work, they sound coherent and solid, this time Brian May's guitar makes the change, another good moment of the album. "Fight from the Inside" is one of the weakest songs in the album, despite the good bass work by Roger , the track never reaches a climax, sounds a bit flat and predictable, QUEEN, maybe for a B class Hard/Metal band this sound would be OK, but not for QUEEN, from whom we always expect much more. "Get Down Make Love" is some sort of Avant and Glam Rock encounter, May provides solid experimentation, the chorus sound dissonant and irrupt when less expected, interesting changes and again coherent structure with Roger Deacon breaking the leader of the drums. It's time for Blues and "Sleeping on the Sidewalk" is a prove that this guys were really versatile, they play Rock, Prog, Vaudeville, 12-bars and now Southern Blues, few bands were able to play all this genres and sound well in all. But if this is not enough "Who Needs You" is some sort of electric Calypso where Freddie's voice delights all of us. "It's Late" begins with Brian presenting us a strong guitar intro that soon is joined by Freddie, seems that song will go by this soft path but the vocal work and chorus that explodes when less expected take us back some years showing that they still had that Midas touch that could turn every song into gold. "News of the World" is closed by the extremely nostalgic "My Melancholy Blues" in which Freddie exploits his ambiguous and magnificent vocal range to take us back to any dark Blues bar in the 40's or 50's, the piano and jazzy drumming are just perfect, strong closer. It's true that "News of the World" is not in the level of the two predecessors, but sill is an excellent addition for any musical collection, so if I want to be fair, I can't rate it with 3 stars being that this is the average rating and this album is above this level, so being that there are no 3.5 stars, will go with 4.